The growth in unmanaged devices owned by employees or contractors is driving adoption of stand-alone mobile application management (MAM) software and services, according to a new report. The need to manage applications on unmanaged devices owned by employees or contractors is driving adoption of stand-alone mobile app management (MAM) software and services, according to a new Gartner report. By 2021, 60% of mobile apps being used in the enterprise will rely on at least one app-level management control, whether on managed or unmanaged devices, Gartner's Market Guide for Mobile Application Management said. Unlike MAM tools that are part of a larger enterprise mobility management (EMM) suite, the use of stand-alone MAM licensing offers lower per-user cost and can be attractive for companies only requiring app management, Gartner said. For other firms, EMM provides the advantage of a single console and policy set. Often a SaaS offering, MAM is a targeted solution that locks down enterprise applications and the data associated with them – not the devices themselves, as mobile device management (MDM) does. When MAM is part of a larger EMM suite, businesses are often required to purchase additional licenses for it. As organizations grapple with enforcing policies on cloud services, they're more often turning to a cloud access security broker (CASB). CASBs can consolidate multiple types of security policy enforcement, such as authentication, single sign-on, device profiling and encryption. CASBs enable access and authorization control over cloud-based resources, such as a cloud-based CRM front end for mobile devices, Gartner said. "It is increasingly apparent that the growth of CASB is more likely to complement rather than replace current mobile management paradigms. Therefore, mobility strategists should become familiar with CASBs due to the impact they are starting to have," the report explained. Because MAM allows a company to control features or access to business applications and associated data, it can provide security whether on a corporate-issued or employee-owned smartphone or tablet. "Currently employed by more than 10% of surveyed organizations to distribute mobile apps, standalone MAM will continue to find favor where enrolling a device in an EMM system isn't practical (as with contractors)," Gartner said. An emerging class of products include mobile integration platforms that augment capabilities from multiple MAM and EMM vendors and introduce new features and capabilities in existing consumer and enterprise apps. For example, Gartner pointed to Appdome's cloud-based Fusion platform, which adds new features and capabilities from Appdome itself or from third-party vendors, including EMM/UEM services/SDKs into existing consumer and enterprise apps on iOS and Android. "This approach positions Appdome as complementary, rather than competitive, with EMM and stand-alone MAM products," Gartner said. Appdome has partnered with EMM vendors such as BlackBerry, VMWare's Airwatch, MobileIron and IBM MaaS360, as well as MAM providers such as Appaloosa. Appdome developed its own software extension to bridge gaps between various vendor SDKs in order to offer multi-vendor app augmentation. In some cases, Gartner said, the requirement for an on-premises solution may require an EMM suite, because stand-alone MAM suites are most often SaaS-based tools. It's also common to see a standalone MAM tool being used to manage one set of devices while EMM is used to manage another. "This could be because of a need for multiple tiers of administration or additional app-level security or user groups with personally owned devices that the organization has chosen not to manage with traditional EMM," the report said. IT managers focused on end-device management should rate their existing EMM for application management by evaluating the suitability of its MAM capabilities for all expected use cases. 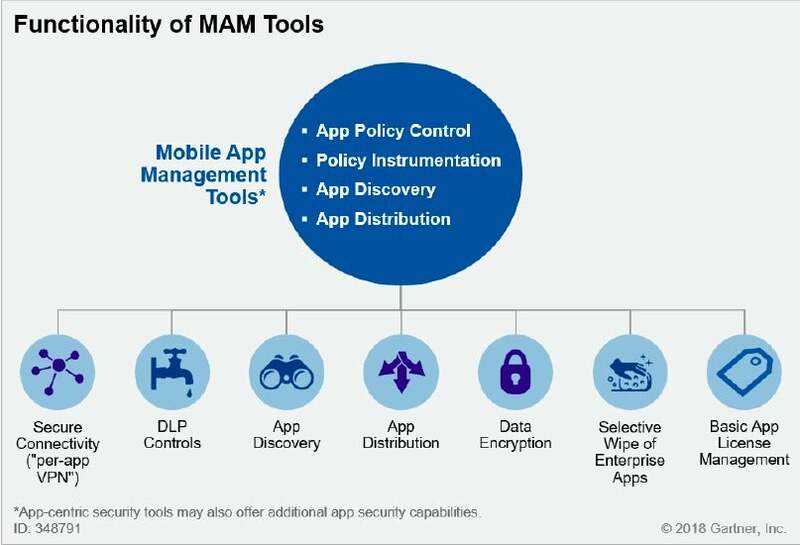 Gartner also recommended an EMM solution for MAM anytime devices can be enrolled in EMM; only when they can't should businesses evaluate stand-alone MAM, app-centric security, and policy tools or multivendor app augmentation tools. An obvious, but sometimes overlooked, recommendation is for an organization to select the best MAM solution by first identifying the particular problems that need to be addressed, since vendors often approach MAM "from very different angles." Finally, Gartner recommends positioning apps to be managed using stand-alone MAM by evaluating the compatibility of MAM tools with certain app types. "Stand-alone MAM, for example, faces specific challenges with public apps, and some MAM products may not work well with certain hybrid app architectures," Gartner said.